My great grandmother's soft molasses cookies get an update whoopie-pie style. Childhood memories of food go way back in my family. One of my mom’s earliest memories of visiting her grandmother is that the cookie jar was always filled to the brim with big soft molasses cookies. It’s a wonderful image… except that my mom never liked soft molasses cookies. She preferred cookies with crunch. When Ila was no longer able to cook my mom continued to bake them for us, often making them as thumbprint cookies with a dollop of raspberry jam. 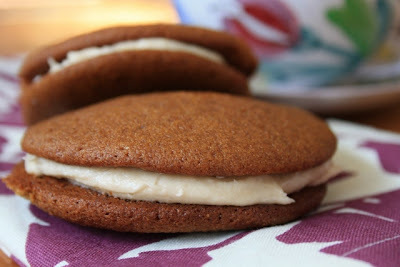 My kids love them whoopee pie-style, sandwiched with a bit of frosting flavoured with vanilla and cinnamon or ginger. Like many cookie recipes, this batter is very forgiving. I once accidentally doubled the butter which made the dough runny. I simply added an extra cup of flour, gave the dough a chance to firm up a bit, and the cookies were still delicious. I have also made the recipe with blackstrap molasses. Mix in order given. Drop on a parchment paper-lined cookie sheet. Bake at 400 for 10 min. Sandwich with a basic icing, flavoured with cinnamon or ginger. Chill the batter for 15 minutes if your cookies are too flat for your liking.